Jori and Jim Manske, principals of Peaceworks, are CNVC Certified Trainers and certified practitioners of Neuro-Linguistic Programming (NLP). Married for more than 30 years, they share the intentions to cooperate together in the great adventure of life, openly and honestly share their deepest thoughts and feelings and honor and accept each other with ever-increasing ability. These intentions continue to frame not only their relationship together, but also all their relationships and work. They have been actively studying communication skills as well as personal and interpersonal awareness since the 70's, presenting training, facilitation, mediations and classes to businesses, community groups, government agencies, NGO's, private groups and individuals since 1971. After living for almost 30 years in Albuquerque, New Mexico, USA, they recently re-located to Haiku, Hawaii, USA. 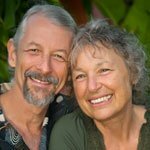 Although based in Hawaii, they travel to the mainland 3 times per year for the retreats of their Compassionate Leadership extended trainings with co-trainers Rodger Sorrow and Faye Landey (compassionateleadership.com), as well as other trainings. They are also working on Pathways to Liberation with co-trainers Jake Gotwals and Jack Lehman, with whom they have developed a self-assessment matrix available at Pathways to Liberation. In June 2008, they completed their term as inaugural leaders of the Global Community Circle (GCC) for The Center for Nonviolent Communication. The GCC mission is to support the growth and well-being of communities in the worldwide CNVC network. Jori served on the CNVC Board of Directors and served as the Interim Director of CNVC from January 2006 until May 2007. During this period, Jim organized several International Intensive Trainings and two Special Sessions for CNVC. Jim and Jori offer training, mediation, facilitation, organizational transformation, coaching, mentoring and classes in integrating NVC. They remain eager to discover new ways of sharing NVC, and offer a variety of trainings through NVC Academy. Join Jori and Jim Manske to explore, learn and practice an NVC approach to mourning and celebration. Taste of Compassionate Leadership Series: Receiving the Word "No"
Join Jori and Jim Manske to explore, learn and practice the art of receiving the word "no," re-framing it from fear into fun.